Mechanical Services - Power Electric & Mechanical Contractor Inc. - Power Electric Inc.
Power Electric & Mechanical Contractor Inc. provides a comprehensive range of Mechanical Services for commercial, institutional and industrial HVACR systems throughout southeastern Pennsylvania. We are a fully licensed and insured mechanical contractor designing, building and servicing heating, air conditioning and piping systems. Our Mechanical Services include new installations and retrofits, web-based building automated control systems, testing, balancing, inspection and service agreements. Whether we are installing, repairing or rebuilding pumps, motors, dock levelers,pneumatic air compressor systems; our Mechanical Services have got you covered, not to mention our metal fabrication and welding capabilities also. In addition, our highly skilled, Mechanical Services technicians are up-to-date on the most advanced mechanical equipment and building automated control systems available today. systems operating reliably and efficiently. 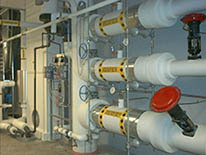 Power Electric & Mechanical Contractor Inc. provides Preventative Maintenance Plans/Programs covering all the above also. Please refer to our Preventative Maintenance Programs page by clicking here. Call Power Electric & Mechanical Contractor Inc. for all your Mechanical Services needs at 215-538-9716 or 610-972-1017…you’ll be glad you did!